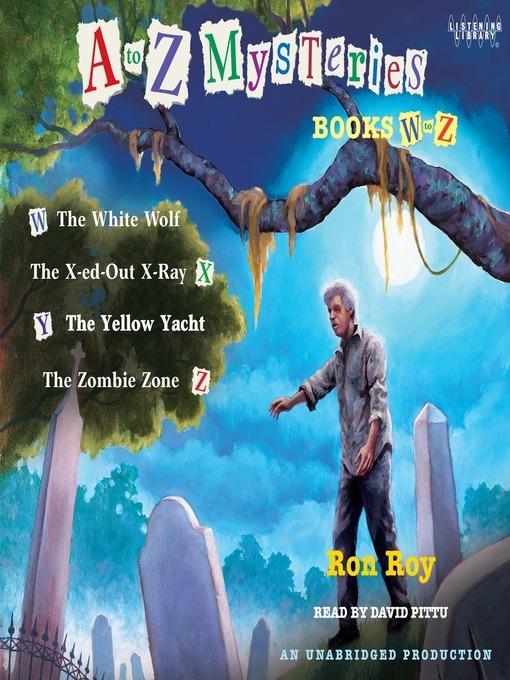 The item A to z mysteries, books w-z, Ron Roy, (eaudio.) represents a specific, individual, material embodiment of a distinct intellectual or artistic creation found in Charlotte Mecklenburg Library. THE WHITE WOLF -- Dink, Josh, and Ruth Rose are thrilled to visit Wallis Wallace at her new cabin in the Maine wilderness. On their very first day, they glimpse a white wolf and her babies on a cliff. But soon after the kids spy the wolf family, the pups are wolf-napped! Can Dink, Josh, and Ruth Rose sniff out the culprits before the white wolf starts suspecting them? THE X'ED-OUT X-RAY -- Dink, Josh, and Ruth Rose are having an excellent time at the Penelope Gwinn concert. But during intermission, Dink injures his arm! At the same time, the singer's diamond necklace is stolen. Could the two mishaps somehow be connected? THE YELLOW YACHT -- The kids love visiting their friend Sammi, the prince of Costra. They swim and admire the bright yellow yacht that is moored just offshore. But the owners of the yacht are acting suspicious. And there's been a robbery on the island. Can Dink, Josh, and Ruth Rose find a connection between the robbery and the mysterious yellow yacht? THE ZOMBIE ZONE -- Dink, Josh, and Ruth Rose are excited to vacation in the Louisiana bayou. But the small village they visit has a problem. The villagers tell stories of voodoo and a giant zombie who has been digging up graves in the cemetery. Can the the tales be true?